With tripod folded: extendable from 13.77 inches to 52.36 inches. With tripod unfolded: extended from 15.74 inches to 54.33 inches. Stable cellphone holder adjustable from 2.04 inches to 3.97 inches compatible with most smartphones. You are able to adjust the head to any angle to capture static shots for your creative needs among holidays, sports events, lecture, presentation, discussion and nearly any activity. 1. Made of strong lightweight aluminum, Lightweight, foldable and portable, easy to Store. 2. Extendable from 13.77 inches to 52.36 inches with tripod folded, with unfolded tripod it can be extended from 15.74 inches to 54.33 inches. 3. Extra-wide holder，Stable cellphone holder adjustable from 2.04 inches to 3.97 inches compatible with most smartphones. 4. With 1/4 inch screw at the bottom fits for attached mini tripod, and also fits digital & Gopro camera & SLR. Removable Bluetooth Remote: compatible with iPhone iOS and Android smartphones. PLEASE NOTE: zoom feature only works for Android phones, iOS has no zoom feature. 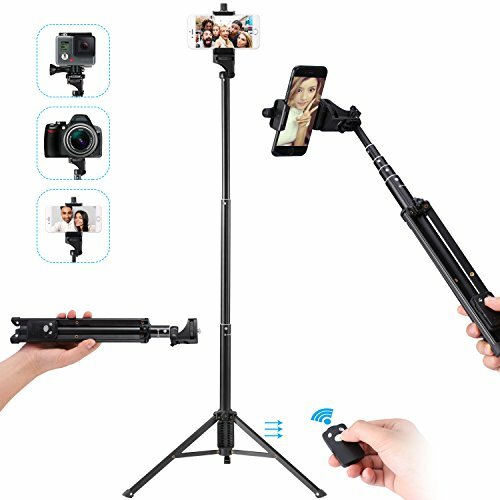 Multi Angle Rotational Head: You can adjust the head to any angle to capture static shots for your creative needs among holidays, sports events, lecture, presentation, discussion and nearly any activity. If you have any questions about this product by Kwithan, contact us by completing and submitting the form below. If you are looking for a specif part number, please include it with your message.